Give yourself enough time for driving since Friday traffic can be brutal. 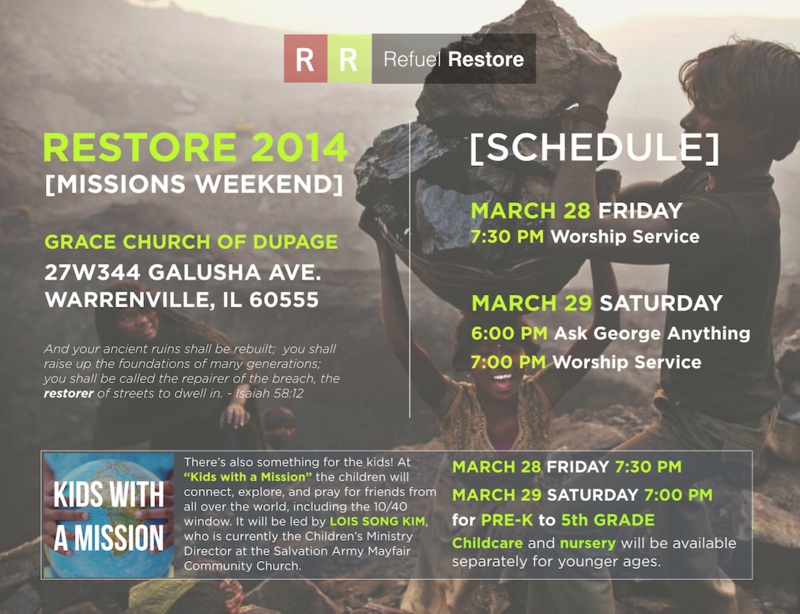 See you there tonight at Grace Church (27W344 Galshua Ave. Warrenville, IL 60555) at 7:30 PM for worship and the Word on missions. Feel free to bring a friend or go with your life group! See you there! Also, don’t forget “Kids with a Mission” (pre-K to 5th grade) will be happening at the same time. Bring your kiddos. Also, childcare is available for your really young ones. For those who have signed up to prepare and provide items for the refugee family we will be back, just a reminder that collection will take place this Sunday (before and after service). We will be collecting the items behind the Welcoming Table, right outside of the Worship Room. For a reminder of what you signed up for, please check here.